A Literary Odyssey: Weekly Wrap-up for May 15, 2011: New Books and Stress. 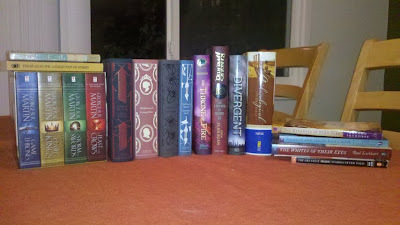 Weekly Wrap-up for May 15, 2011: New Books and Stress. I have truly been running on empty all week. I fell behind on sleep Sunday night and just never caught up. With interim grades due Tuesday morning and lots of things to grade and finish during the week, I was stressed and at my limit. But, things will only be getting better this week. I have 1 more week with my seniors before they are done, and their big projects are underway. They were put in groups of three or four, and together they decided on a broad topic (like Survival, Love/Romance, Addiction, Heroes, etc). With their group members, they developed a theme and then a thesis. Each member had to find five sources (3 fiction (1 of those a novel), 2 non-fiction), and then put together a multimedia presentation that would last 50 minutes (a little under a class period). Sound crazy? It is. They also have to write a big formal outline and an annotated bibliography of their sources, so they have been stressed. But, the first two groups went and I was thoroughly impressed, so I hope the next 5 groups are as wonderful. I only have 5 more weeks of teaching and working at the park, so I will make it through. It really stinks not having any free time, but I'm doing okay. Tired and a little cranky, but I am managing well-enough. On top of those are two paperbacks (a collection of Robert Frost poetry and Edgar Allen Poe stories) that I won from Trisha! THANK YOU! I will love them forever. The Throne of Fire by Rick Riordan: Okay, technically I haven't read the first in the series yet, but I know I want to get to them sooner or later. Divergent by Veronica Roth: I love a good YA novel, and since hearing about this one a while ago, I knew I wanted to read it eventually. When I saw one little copy sitting on the shelf all by itself...well, it ended up in my arms. Archeological Study Bible: I posted about this yesterday, but I am going to start reading the Bible, and this is the edition I chose. A whole slew of paperbacks. Includes The Madonnas of Echo Park (a win from hosting the readathon), and three ARCS from HarperCollins (including Tolstoy and the Purple Chair), which I cannot wait to read! So yes, lots of new reads to get to at some point and only a handful from my list. You are quite welcome on the Frost and Poe collections. I hope you enjoy them! I have the first three books in the Game of Thrones series. My boyfriend and I don't have HBO either so we'll just wait for the DVD's. I reaaaaallly want Rick Riordan's Percy Jackson books. Actually, I want all of his books, but I want to start with his first series. I enjoyed the movie. I've been wanting to read the Bible as well, just to say I did it and to also have a better understanding when it is referenced in literature. 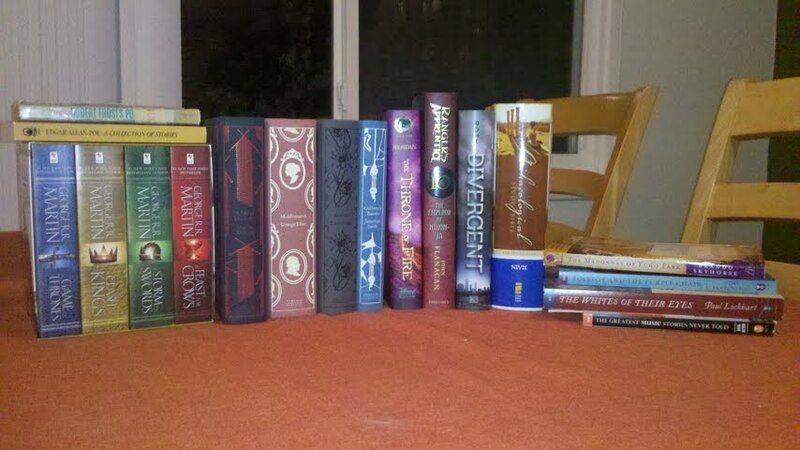 I've heard good things about Divergent too, so that is on my wishlist. How are you grad school apps coming along? Hang in there!!! I love the project idea, too. Awesome! If we had more time in an academic term, I'd have my students do something similar. Can't wait for the Vanity Fair readalong! Awesome haul! I wish I had bought the boxed set of the George RR Martin books. I have the first three, but I bought them at different times and the 2 have the older design, and 1 has the newer design (like the ones you have). It bothers me that they don't match! You own A LOT of books. :-) That Robert Frost collect -- ah, I envy that. He's one of my favorite poets. One day I'll get a collection. That really sounds like a neat project for your seniors. I remember towards the end of my senior year of high school, our English teacher decided to have us present our (individual) research papers as a speech rather than writing them out. As with your class, we still had to hand in outlines and bibliographies, but it was really nice to have a break from the typical. You have some lovely new acquisitions, too. It's too bad the clothbounds don't fit on the same shelf as they look so lovely all together. Enjoy your week--hopefully it's much less stress! So glad you're reading The Game of Thrones! I've never read anything on them on the blogs I follow - maybe people read them a long time ago? I'm really looking forward to your thoughts. I am a Middlemarch NERD. Love that book to tiny pieces. Dracula is also great, the epistolary bent works like gangbusters in it. I don't know how you do it...hang in there!